The final season of Nikita premieres on The CW later this year, and at Comic-Con, we talked with members of the cast and showrunner Craig Silverstein about what’s coming up for the final run. “Nikita is on the run,” Stanford tells us, although that much was obvious from the Season 3 finale. “We’re all looking for her. We want to reunite the family. Birkhoff and Ryan start off in their brand new HQ, which is a jumbo jet tricked out into a spy-tech lair. So, we’re the eye in the sky, handling all the tech and brains as per usual,” he says. 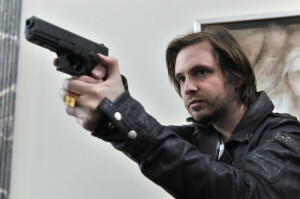 Season 4 will actually give us a chance to see Birkhoff even before the events of the start of the series. “You’re going to get the Birkhoff origin story, which I’m pretty excited about. I can’t say too much, but I will say that the Birkhoff that we know and love might not actually be the Birkhoff that we know and love,” Aaron reveals. Might Percy be part of that story? “I hope so. That would be really cool. I haven’t discussed those particular details, but I’d love to see Xander Berkeley come back. Everybody misses him. He’s a great character,” he says. All in all, the Nikita cast seemed ready for a fourth season when thy finished Season 3. “We were all pretty confident that there was going to be a Season 4. I think Season 3, we were really uncertain if that was going to happen at that time, but 4, everyone kind of thought it was going to be a shoe-in. The surprise was that it was six episodes. None of us really expected that. But I’m actually excited. I think six episodes is a chance to really tell a really nice, complete, tight story, without having to stretch something really thinly out over 22 or 23 episodes. I think it’s going to be a nice, tight story,” he says.